The university officially announced their consultatory search committee today to aide Athletic Director John McCutcheon in finding a replacement for Toot Cahoon. The committee consists of Associate Athletic Director Rocko DeLuca, Pond Club President and former player Mike Merchant, former Assistant Captain Peter Trovato, Isenberg Professor Glenn Wong, Jeff Smith the Associate Athletic Director for Sports Medicine, and Assistant Vice Chancellor Juan Jarrett. It’s good to see a couple of former players on the committee. Merchant can double as a former player and a representative of the Pond Club. Trovato is the type of person I’d love to see continually come out of the hockey program; hard worker on the ice, active in the community, and, as a recent Harvard Business School grad, setup for success after graduation. There are few better representatives of the UMass program than him. Though there has been some serious questions about the athletic department’s attention on the hockey program lately I’m happy to see DeLuca on the committee as he is regularly in attendance for UMass hockey games both home and away and actively engages fans of the team. I only know of Professor Wong, but his reputation on campus is top notch. Probably the highest profile faculty member of the high profile Sport Management program, Wong is seen as an expert on college athletics. I can’t say I’m familiar with Smith or Jarrett. Originally I was disappointed that a current player was not given a spot on the search committee, as I’ve seen that in past searches around college athletics, but with UMass without an easy choice for captain next year it’s tough to say who that representative should’ve been. Now how much influence does this committee actually have? My many years of following college sports tells me they’ll probably matter little in the overall scheme of things, but we’ll see. At the very least I’m glad there are a number of people who have my confidence who may have at least a small say in the biggest decision facing the program in over a decade. Nick Canelas of the Collegian says Toot’s time was up. UConn has officially become the 12th team in Hockey East and will begin play in 2014-15. I know I haven’t been the biggest advocate of the Huskies joining the league, but at least according to most news stories my biggest concerns are being addressed. First, UConn will be able go from zero to 18 hockey scholarships plus the equivalent needed on the women’s side to stay Title IX compliant. Second, though they’ll start out playing all their league games at the cavernous XL Center in Hartford, it does sound like they’re committed to renovating/replacing the pathetic Freitas Ice Forum within their first few years after the jump to get the games back on campus. Frankly, as long as they do those two things in a reasonable time period I’m fine with this decision. Lastly, I want to apologize for something I wrote earlier in the week. In talking about Toot Cahoon’s legacy here at UMass and in an effort to show how far he was able to move the program in a short amount of time I wrote “UMass hockey was god awful when he took over for Joe Mallen in 2000. The program was so historically bad the fans should’ve been wearing paper bags on their heads. But that would’ve required fans.” These were flippant remarks to make an exaggerated point and I should’ve been clearer that by no means was I knocking those who played during those years. I have nothing but respect for those who wore the beloved triangle jerseys during that time. Those teams mean a lot to me. I was not really a fan of hockey and knew little of how the game was played when I walked onto campus as a freshman in 1993. Watching the likes of Rob Bonneau, Tiger Holland, and Brian Regan is how I learned the game of hockey and fell in love with it. I did not intend to sound like I was taking a shot of those players. Did those teams lose a lot of games? Sure did. Did they play in front of “friends and family” crowds? Too often. But that was not because those players did not have talent or didn’t work their asses off representing UMass. There are a number of factors why UMass did not see much success in the 90s, the primary one being that starting up a program from scratch and entering Hockey East after just one season in existence is akin to trying to assemble a car from nothing more than parts while going 65 MPH in the fast lane of the Mass Pike. I appreciate what the players of that time were able to accomplish. I didn’t get to see a lot of wins during my time as a student at UMass but I wouldn’t trade those memories of sitting in the Mullins and cheering on those pioneers of UMass hockey for anything else. 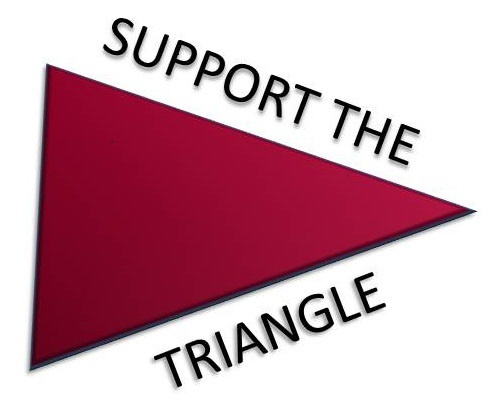 That’s why this blog is Fear The Triangle and not Mauldin’s Marauders, The Quick And The Dead, or something of the like referencing the more recent years of UMass hockey. I was a UMass-Amherst student 1998-2002, and also fell in love with hockey at Mullins. Jeff Blanchard, Toni Soderholm and the rest were my intro to hockey – not a good team, but a tough, scrappy, enjoyable team. It was a small, devoted fanbase who never missed a game, and always revelled in sitting behind the opposing team’s bench and heckling their players and coaches – Jack Parker even came out before one game (we were always there about an hour early) and sat with us and chatted a bit to tell us how much he enjoyed what we brought. Another great memory – Coach Mallen paying for a bus to bring fans to Merrimack for the team’s last game (we had planned to caravan – my buddy and I showed up at Mullins figuring we’d trade gas/beer money for a ride), and the team losing but putting on a great show, and Blanchard dropping his gloves looking for a dance partner. That said, Coach Cahoon was exactly what the program needed at the time. Coach Joe’s time was up and Coach Cahoon brought us not quite to national prominence, but to the verge. There’s no reason UMass can’t be a top-flight program with the right people in charge. Look at the resurgence in basketball, the D-I move in football and the success (postseason notwithstanding) in men’s lacrosse – all the ingredients are there and hockey can be next. Love the blog – keep up the good work! Great stuff Bill. Glad to see the fans of that era still following the program. Just catching up on this entry, Rocks. Nick Canelas’ article while chock full of observations, most obvious to me the casual fan, continues to harp on the thing that apparently pushed Toot off the deep end, the radio deal. While that in fact may be true, Canelas and other writers imply this wouldn’t have happened with a better team or with an administration that cares. Neither could be farther from the truth. If you read the UMass/WEEI release it’s a treasure map potentially to find what football games will air on 105.5 and which ones will air on second rate AM, based on multi team conflicts, NCAA and professional. There’s not enough room for 2 UMass sports never mind 3. Let’s set the record straight, this radio problem is a problem if happened in 2008, 2010 or now. There is only so much room..
Let me clarify George. The radio deal wasn’t so much a problem because it didn’t include hockey (although the sport is still homeless). The problem was how it was handled, how the release was worded, the fact that the subject of hockey was omitted entirely, and the fact that the dept itself was putting more attention on that deal than, I don’t know, a former hockey star winning the Cup and Conn Smythe hours before. The radio deal wasn’t why the two sides parted. It was the straw that broke the camel’s back, but there were bales of straw previously (straw comes in bales, right?) some coming earlier in that very week, that were equally as responsible for what happened. LOL, good straw humor. Or barley in your case right? Thanks for the quick response. Let’s hope the new coach is as good as the media; you, print and radio that have covered this team through the seasons and now. I’m frustrated but at least greatly informed frustrated! Shared frustration is pretty much what this blog has been about ever since I started it. Glad to help fellow fans follow the team however.